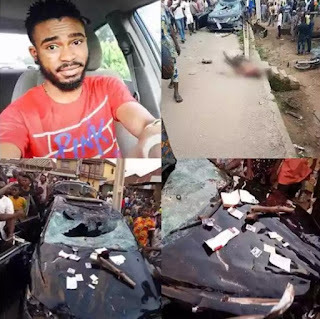 A final year undergraduate, Building Technology student of the Federal Polytechnic, Ede, Osun State, was, yesterday, lynched for using his car to kill at least five people, including some Post UTME students. According to report, the deceased, identified as Fisayo, said to be a yahoo boy, was driving recklessly with two other friends, when they first hit someone at Akoda, then, while being chased, they hit another person at Eleha, Bepo. While still fleeing, they rammed into a bike rider with his passengers at Orita Oloki, where they were eventually tracked down and Fisayo was beaten to death, as his friends fled. . Many people said the occupants of the car were drunk or high on drugs due to the amount of drugs retrieved from their car, which was later destroyed by the angry mob. Fisayo allegedly wrote his final exam as an undergraduate, just last week.